Most dialects of modern English have two close back vowels: the near-close near-back rounded vowel /ʊ/ found in words like foot, and the close back rounded vowel /uː/ (realized as central [ʉː] in many dialects) found in words like goose. The STRUT vowel /ʌ/, which historically was back, is often central [ɐ] as well. This article discusses the history of these vowels in various dialects of English, focusing in particular on phonemic splits and mergers involving these sounds. In the Old English vowel system, there was a pair of short and long close back vowels, /u/ and /uː/, both written ⟨u⟩ (the longer vowel is often distinguished as ⟨ū⟩ in modern editions of Old English texts). There was also a pair of back vowels of mid-height, /o/ and /oː/, written ⟨o⟩ (the longer one often ⟨ō⟩ in modern editions). At some point, short /u/ developed into a lax, near-close near-back rounded vowel, /ʊ/, as found in words like put. (Similarly, short /i/ has become /ɪ/.) According to Roger Lass, this laxing occurred in the 17th century, but other linguists have suggested that it may have taken place much earlier. The short /o/ remaining in words like lot has also been lowered, and unrounded in some accents (see open back vowels). The strut–comma merger or the strut–schwa merger is a merger of /ʌ/ with /ə/ which occurs in Welsh English and some higher-prestige Northern England English. It is also usual in General American, and it causes minimal pairs such as unorthodoxy /ʌnˈɔːrθədɒksi/ and an orthodoxy /ənˈɔːrθədɒksi/ to be merged. The phonetic quality of the merged vowel depends on the accent. For instance, in merging General American accents [ʌ] is the stressed variant, the word-final one is [ɐ] and elsewhere the vowel surfaces as [ə] or even [ɪ̈] (GA features the weak vowel merger). This can cause words such as hubbub (/ˈhʌbʌb/ in RP) to have two different vowels ([ˈhʌbəb]), even though both syllables contain the same phoneme in both merging and non-merging accents. On the other hand, in Birmingham, Miami and Swansea at least the non-final variant of the merged vowel is consistently realized as mid central [ə], with no noticeable difference between the stressed and unstressed allophones. Because of the unstressed nature of /ə/ the merger occurs only in unstressed syllables. Word-finally, the two vowels do not contrast in any accent of English (ME /u/, the vowel from which /ʌ/ was split could not occur in that position) and the vowel which occurs in that position approaches [ɐ] (the main allophone of STRUT in many accents), though there is some dialectal variation, with varieties such as broad Cockney using strikingly more open variants than other dialects. It is usually identified as belonging to the /ə/ phoneme, even in accents without the /ʌ–ə/ merger, but native speakers may perceive the phonemic makeup of words such as comma to be /ˈkɒmʌ/ rather than /ˈkɒmə/. 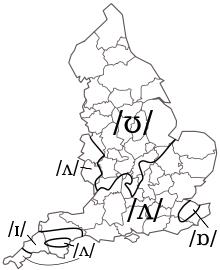 This open variety of /ə/ occurs even in Northern English dialects (such as Geordie) which have not undergone the foot–strut split, though in Geordie it can be generalized to other positions so that not only comma but also commas can be pronounced with [ɐ] in the second syllable, which is rare in other accents. In contemporary General British the final /ə/ is often mid [ə], rather than open [ɐ]. Some other minimal pairs apart from unorthodoxy–an orthodoxy include unequal /ʌnˈiːkwəl/ vs. an equal /ənˈiːkwəl/ as well as a large untidy room /ə ˈlɑːrdʒ ʌnˈtaɪdi ˈruːm/ vs. a large and tidy room /ə ˈlɑːrdʒ ənˈtaɪdi ˈruːm/. However, there are few minimal pairs like this and using them as such has been criticized by scholars such as Geoff Lindsey because the members of such minimal pairs are structurally different. There also are words which in RP always have /ʌ/ in the unstressed syllable, such as pick-up /ˈpɪkʌp/ or sawbuck /ˈsɔːbʌk/ which in merging accents have the same /ə/ as the second vowel of balance. In RP, there is a consistent difference in vowel height; the unstressed vowel in the first two words is a near-open [ɐ] (traditionally written with ⟨ʌ⟩), whereas in balance it is a mid [ə]. Compare the identical development of the close front FLEECE vowel.